Cal State LA has been awarded a grant to educate tomorrow’s leaders in the interdisciplinary field of paper microfluidics. The $375,000 grant from the W.M. Keck Foundation aims to engage more than 1,500 undergraduate students annually in the research of paper microfluidics to contribute to solving real-world scientific problems. 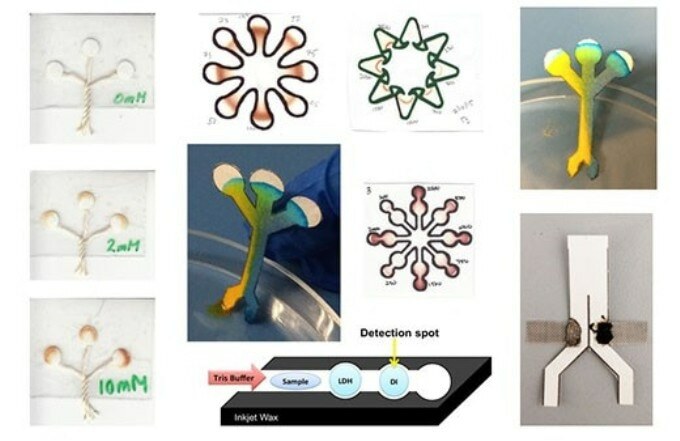 Paper-based microfluidics is a system of fluid analysis. Paper is used because of its availability, low cost, and ability to transport liquids such as blood and urine. Fluids flow through paper via capillary action in much the same way liquid travels through a paper towel. Microliter volumes of liquid can be easily manipulated over small areas. This allows for low-cost analysis. The three-year grant will focus on transforming current curriculum and generating new knowledge by developing and integrating course-based undergraduate research experiences (CUREs) into courses in the University’s Departments of Chemistry and Biochemistry and Biological Sciences. The grant also aims to increase the retention and graduation rates of students in science, technology, engineering, and math. Students enrolled in the classes will work on projects involving POC diagnostic devices, fuel cells, and metal detection, which are at the forefront of microfluidics research. The program links course content to real-world problems. Gomez will lead a team of Cal State LA faculty that includes Chemistry Professors Scott Nickolaisen and Yong Ba, and Biology Professors Elizabeth Torres and Kirsten Fisher. Professor Gisele Ragusa from the USC Rossier School of Education will coordinate the assessment and evaluation component of the project. The grant from the W.M. Keck Foundation underscores Cal State LA’s commitment to the continued advancement of its STEM programs. The University is a national leader in STEM. The W.M. Keck Foundation was founded in 1954 by the late W.M. Keck, founder of the Superior Oil Company. The foundation seeks to generate far-reaching benefits for humanity by supporting pioneering discoveries in science, engineering and medicine, and organizations that enrich the lives of children, youth and families. What an interesting story and use for paper!